Kuramon have begun to appear all over Japan. Izzy discovers that the root of the problem on the internet. It is none other than Diaboromon! Matt and Tai go on the internet with their digimon to fight Diaboromon once again. Just like last time Omnimon defeats Diaboromon. The evil digimon had a back up plan this time. Even more Kuramon begin to show up in the real world. They head for the ocean. Once there they all merge into one powerful mega digimon, Armagemon! Omnimon arrives in the real world to fight Armagemon. None of his attacks work on the evil digimon. Omnimon connects with a Supreme Cannon right down Armagemon's throat, but it has no effect! Armagemon KO's Omnimon with a few blasts, knocking Omnimon's arms off. Ken and Davis show up, and their digimon evolve into Imperialdramon. Armagemon blasts Imperialdramon, but the mega digimon rises from the smoke in his Fighter Mode! Imperialdramon blasts Armagemon with his ultimate attack, Giga Death (Giga Crusher in English version). When the smoke clears Armagemon still lives! All seems lost, when suddenly Omnimon's body begins to glow. He transforms into a sword that floats up to Imperialdramon. He grabs the sword, and is transformed into Imperialdramon Paladin Mode. IPM flies down towards Armagemon and stabs him right in the nose, causing the evil digimon to disintegrate. The Kuramon that formed him are still alive. Beams of light come from the kids digivices and from the cell phones of different people. The Kuramon are taken care of, and the digidestined have saved the day again. 1. 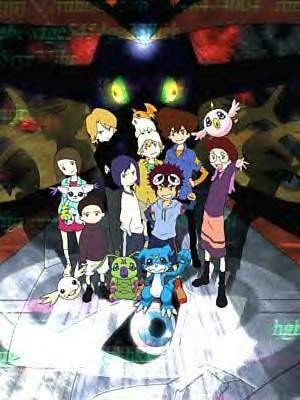 This movie is the end of Digimon Adventures. 2. Imperialdramon's Giga Death was done differently than in the end of season 2. 3. Agumon and Gabumon evolved directly into Omnimon without going to their mega levels first.